Raf's Recollection | More about our conversation with our pal Mike Jasper coming soon! VERBAL TAP (Episode 24) with Rafael Lovato Jr.
[buzzsprout episode='93633' player='true'] Raf's Recollection | In martial arts, when a Black Belt is kind enough to give you their time, you take it. With every demonstration, every suggestion, every sparring session, they provide the kind of insight that can literally change a person’s life. 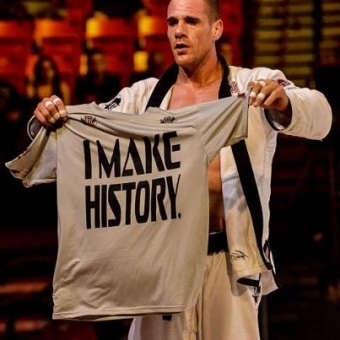 Which is why we were beyond fortunate to have Rafael Lovato Jr. stop by the podcast to give us more than an hour’s worth of his time. Not only did the decorated American black belt talk about his own Jiu-Jitsu journey, but he also candidly discussed the struggles he’s faced over the years to achieve his dreams and "make history." Honestly, we could have devoted an entire other podcast just to name the laundry list of accomplishments the man has achieved, but somehow Kev and I managed to cage our inner-bjj nerd tendencies to ask him about his competitive drive, how Chuck Norris changed his life (seriously, he did), and the circumstances that prompted him to make this terrifying face. Already a gi and no gi World Champion, Lovato made history last month when he became the first non-Brazilian to win the Absolute division at the Brasileiro. Becoming the first American to win the open weight division in one of the most competitive Jiu-Jitsu tournaments in existence. To put that in perspective, if the average BJJ enthusiast or practitioner (such as you or myself) won said competition, it’s very likely a majority of us would spend most of our days walking around like this. There’s so much about Rafael’s journey that you don’t see on the mats. It is especially true that behind every great accomplishment is a story that is every bit as exceptional—and to get to hear the man (who, himself, grew up without the guidance of a Black Belt during his formative years) describe it is nothing short of a treat. If you’re even remotely interested in the art of Brazilian Jiu-Jitsu and don’t find something that connects to your own journey in this interview, I’m gonna suggest that you have someone check your pulse. In all my years of conducting interviews, I don’t ever think I’ve been able to gain better insight into an athlete’s mindset and drive, let alone a Black Belt’s. A day after this interview, I went to train and had a spectacularly awful day of Jiu-Jitsu. To be specific: I gassed out, I didn’t feel I performed up to my best, and I quit on myself (while I can accept wins and losses, I don’t accept quitting on myself). When I walked out of my training sessions, I couldn’t help but keep the last part of this interview with me. Suppose that’s why it’s important to know that when a Black Belt gives you their time, you take it. Otherwise, you might just miss out on making your own history. EDIT: For those wondering what Lovato's Brazilian Absolute matches looked like, simply head on over to the following link to watch Lovato break down his own matches!